An efficient Josh Perkins is a lethal Josh Perkins, and he was one of the reasons the Zags beat BYU Saturday. In a dramatic weekend for college basketball off the court, Gonzaga found a way to avoid theatrics and clinch its 19th regular season championship in 21 years. The Zags rewarded the Brigham Young University Cougars with an anticlimactic drubbing that almost made up for the previous year's finale and sole blemish on the regular season schedule. 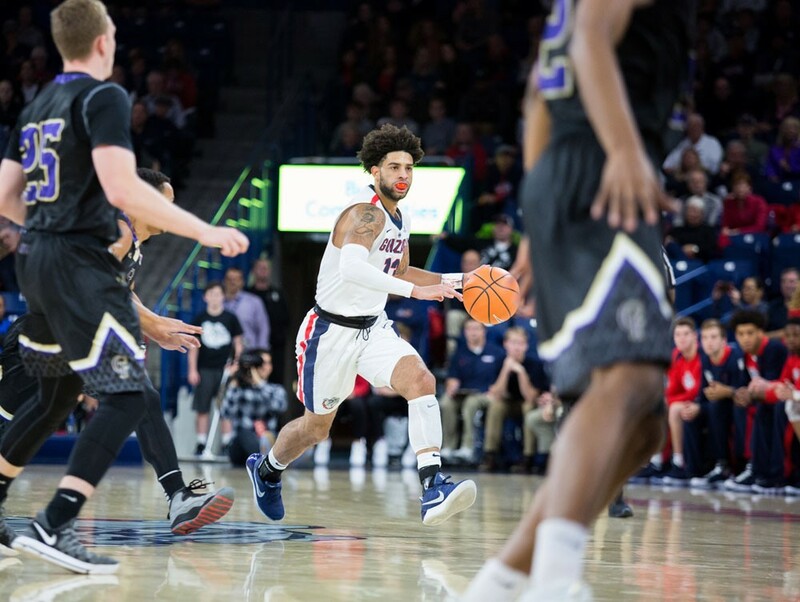 The final two games of the Gonzaga season felt like the full spectrum of how its 2017-18 season had gone leading up to Thursday's matchup against the San Diego Toreros. The Zags won an ugly game in the Jenny Craig Pavilion, where — like in other close regular season matchups — they did just enough to win. The back court never had a real opportunity to click, thanks to an off shooting night and a handful of questionable foul calls that left them out of sync. Perhaps to the uninitiated, a single-digit and hard-fought game against a middling West Coast Conference team would leave questions about whether or not a team ranked six going into the night deserved to hold onto that ranking. But that would ignore the fact that the Toreros are a legitimate defensive team that slows the pace of play to a crawl and has hung tight with practically every team they've matched up with this season. Then Saturday night happened, and viewers were able to see the potential highs that this team could see in the next six-plus weeks. The back court was on and the Cougars did not have an answer. Josh Perkins and Silas Melson put on a clinic on offense, finding the median of asserting themselves and taking what their opponent gave them. Perkins finished with 14 points and seven assists, while Melson contributed 12 points and three assists. Zach Norvell, who still is working through his perimeter shot, brought in 15 points thanks to his knack of attacking the basket. When the three guards are able to see the ball go through the basket, the Zags look like a real tournament threat. And beating Saint Mary's and BYU on the road by an average of 13.5 points won't go unnoticed by the committee. The Zags played great team defense, limiting the damage done by the Cougars' three-headed attack of Yoeli Childs, Elijah Bryant and TJ Haws. Notably, Bryant's dangerous three-point shooting (40 percent on the season) has disappeared when facing the Zags, shooting a combined 2-17 against them. The results may seem unsurprising due to Gonzaga's track record, but lest we forget that Saint Mary's was the favorite to usurp the Zags a year after they made the national championship. Instead, the Zags could see themselves well into the top 16 of the committee's seeding by the time conference tournaments wrap up. And there is some poetic justice in all of this going down in front of 19,000 BYU fans who remain unsatisfied with their transition into the WCC. BYU's six losses this conference play are the most they've dropped since joining. Even though this team may not be the best team that's graced the Kennel, this certainly feels like one of the best efforts coach Mark Few and his staff have compiled in a tenure known for its consistency. Three starters gone, a lottery-pick freshman nabbed and we're still left with a team that refuses to overlook its obligations. As top-ranked teams continue to drop and we see more of the fallout and potential suspensions from the FBI investigation, who knows where Gonzaga will land by Selection Sunday. If they win out, it's hard to imagine a result worse than a four seed, while a three seed would not be out of the realm of possibility. The Zags have put together two of their most complete games against their two biggest adversaries, a good sign for when the competition ramps up. One thing is for sure, it's good to be safe on top.